The New Social Worker Online Blog: Winter 2013 issue of THE NEW SOCIAL WORKER is available now! 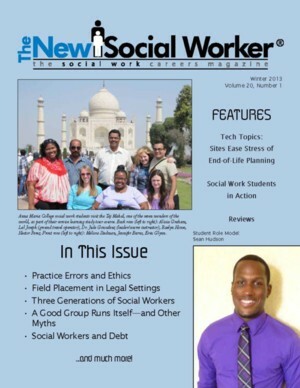 Winter 2013 issue of THE NEW SOCIAL WORKER is available now! Happy New Year! I am very excited that we are starting our 20th year of publication of THE NEW SOCIAL WORKER magazine! We have a lot in store in the coming year. The Winter 2013 issue of The New Social Worker magazine is now ready to download! It is available, free of charge, in PDF format, directly from The New Social Worker Web site. I am thrilled to announce that in this issue, we are introducing a new ethics column by Dr. Allan Barsky! Dr. Barsky is the chair of the NASW National Ethics Committee. He will be sharing his expertise with us in his new Ethics Alive! column. If you have not already subscribed to the quarterly magazine, THE NEW SOCIAL WORKER, why not do so right now? Why not subscribe to our monthly e-news and other announcements, too? The Winter 2013 issue is hot off the press! Highlights include following up on practice errors, field placement in legal settings, group work, social worker debt, new acronyms, what social workers need to know about people, online resources for end-of-life planning, book reviews, and more! • Educational and Credit Card Debt: What’s a Social Worker To Do? I am very excited about 2013! Please let your colleagues, classmates, and/or students know about THE NEW SOCIAL WORKER, and the fact that it is a FREE social work resource. Feel free to pass along the download links above, and let them know that they can subscribe free to receive notifications of future issues. Again, you can subscribe at our subscription page.